I have reviewed books in the past, but I've never actually posted them anywhere so this is a first for me guys! However I couldn't turn down the opportunity to review Confessions of a Hostie as I had heard so much about it from the tumblverse over the past few months! anecdotes of her profession! Waiting for Starbucks to open she picks the peanuts out of a snickers bar and tells us that chocolate is her favourite food group, as she then worries about what the maid will think of the chocolate stains on the bed sheets! Her character (although already real) becomes a real life person that we can all relate to in some way, and it feels as if we are her friend. 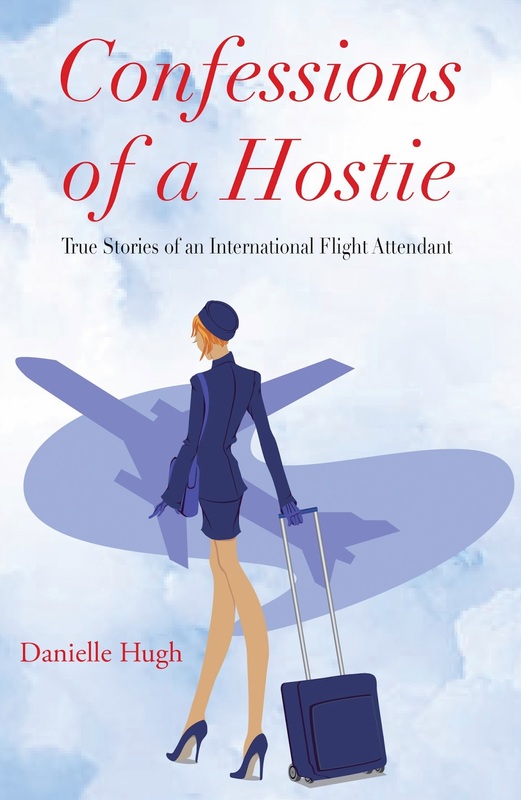 When she is on board the plane, we bypass the casual flight stuff that the passengers see, and it's replaced with sneak peeks of what happens behind the curtain we all watch the hostesses disappear behind whenever we need them most! But it's not all jet setting and exploring the world, it's long stressful sleep deprived hours facing your own problems as well as the passengers. If you get your period at 37,000 feet, you can't tell the old gentlemen in 16F to move over, take his chocolate and then snuggle down with a chic flick; all you can do is stock up on Feminax and and hope for smooth sailing! I got the chance to ask Danielle a few questions after reading her book, so after panicking for 20 minutes about sounding like a bumbling idiot, I finally emailed her! The questions and answers are posted below, however if you have any of your own, you can head over to her facebook and I'm sure she will gladly answer them! What made you decide to become an air hostess, and if you could go back in time and choose a different career path, do you think you would go into a different industry? You said that you have narrowly missed so many natural disasters and terrorism attacks throughout your career, does that not scare you? I know that I describe myself as a 'live in the moment' kind of girl but if I had been through as many near misses as you, I would be scared to leave the house! Can you believe that last week I was in LA Airport and missed the shooting episode there by a matter of hours? My family and friends were so concerned. The reality is; it is a massive airport, it was terminal 3 which I don’t go to anyway, and the odds of being directed at risk were remote. Realistically I have more chance of being in a car accident driving to work than something happening in a foreign country. I won’t pretend that the thought of being in some of these disasters is terrifying, but an old saying goes: it is better to live a crowded hour than an eternity with no name. What are some of the most interesting places you have visited, and is there any places that you haven't visited but would like to? We often only get minimal slips/layovers, and they are always in large cities. They can be fantastic – New York, Rome, Paris, Sydney, San Francisco, HK etc, but given a choice, I like to get away and explore the rural areas; the less explored. I am well-travelled, but it is a big world out there. I have only scratched the surface. What persuaded you to write a book about your experiences? and did you have any previous writing experience beforehand? No previous published work, but I dabbled. I love the writing process – and with my job and lifestyle I get to see and experience much. I always considered myself a natural storyteller, so it was a progression to write a book (or two or three). I actually have the time to write (often at 02:15 jetlagged and exhausted, but writing to me is therapeutic). Most crew get so agitated with a three hour flight delay, being stuck in an airport terminal. Not me – I grab a coffee and then take out the laptop and type away. What are some of the highlights and lowlights of being on the road/being away from home for so long. And is there anything you wish you could take with you that you can't? I love my own home and my own bed. Some hotel rooms are great, but they are not home. and finally, a question you have probably had a billion and one times, but what advice would you give to anyone that was thinking of pursuing a career as an air hostess? If they can talk face-to-face with someone in the industry (like me) it is a massive help. Most airlines have websites outlining the criteria for applicants. Often getting the job is the hardest thing. It is about being in the right place at the right time, so it pays to be persistent. More than anything else; they must really want the job first. They must be passionate, not just about the lifestyle, but the job also. If one thing about my writing should show the reader is: there are a lot of highs, but also lows. My favorite saying about the job/lifestyle is: there are a hundred negatives, but a thousand positives. Not everyone can handle the negatives. It is not for everyone, but if it is... apply, apply, apply. and she also has a website! It's only an e-book at the moment, so whip out your kindles/Kobos/iPads/iBooks/or other book reading apps, and read it now!